When I tutor Common Entrance candidates at either 11+ or 13+, I explain how to approach the two main types of question in the entrance exam: the reading comprehension and the composition. Most 11+ papers last an hour or an hour and a quarter, and the marks are equally divided between the comprehension and the composition. That means half an hour or so for the comprehension. The 13+ exam is a little different and may involve two papers, one covering a prose comprehension and the other a poetry comprehension and a story. Whatever the format, it’s very important to read the instructions on the front cover. They will tell you exactly what you have to do and – crucially – how much time to spend on each section. When it comes to doing a comprehension, I recommend a five-step process that involves reading the passage, reading the questions, reading the passage again, answering the questions and then checking your work. Reading the text may take five minutes or so, reading the questions a minute or two, re-reading the text another five minutes and checking your work another five minutes after that, which leaves only 15-20 minutes to answer the questions. If there are 25 marks available, that means around 30-45 seconds per mark. The number of marks available for each individual question will tell you how much time you have in total, eg two minutes for a four-mark question. Read the passage (5 mins). The text is usually taken from a short story, a novel or a poem. Whatever it is, the most important thing to do is to make sure you understand it and remember the main points. Rather than reading it as fast as you can – just to get it over and done with – you should go as slowly as you would if you were reading it out loud and make sure you understand everything. Re-read any bits where you get stuck and ask yourself the W questions as you go along: who, what, where, when, why and how? It may help to repeat the story or the message to yourself – just to make sure everything makes sense. Read the questions (1 min). Once you’ve read the passage, it’s time to read the questions. Again, understanding and memorising them are more important than sheer speed. When you re-read the text, you’ll need to look out for answers to all the questions, and you won’t be able to do that if you can’t remember what they were! If it helps to jog your memory or draw your eye to the most important bits, you can underline key words and phrases in the questions or in the text itself, eg if you have to give the meaning of the word ‘annihilate’ in line 25. Read the passage again (5 mins). Some people suggest only reading the passage once, but the danger of doing that is that you’re not so familiar with it, which means you can’t answer so many questions off the top of your head and often have to hunt through the text for the answer. What that means is that you effectively end up reading most of the passage three or four times just looking for the bit you need! Reading the text twice is probably a good compromise between speed and memorability, and it also gives you the chance to underline or mark the answers to any of the questions that you happen to spot as you go through. Answer the questions (15-30 mins, depending on the length of the exam). Read the question carefully. You don’t get any marks for answering the wrong question, so make sure you know exactly what you have to do. If that means reading the question twice, then that’s a price worth paying. Use the mark scheme as a guide. Most exam papers will let you know how many marks are awarded for each question, so it’s worthwhile bearing that in mind when you’re writing your answers. There’s no point spending ten minutes on a question that’s only worth one mark, and it would be daft to write only one sentence for a question worth ten marks. If it helps, you can always work out how much time you have for each question. For example, if you have 15 minutes to answer questions worth 30 marks, you’ll have 30 seconds for each mark, which means two minutes for a four-mark question. Follow any instructions to the letter. All these hints and tips are useful, but they are only general rules. Occasionally, examiners will let you off the hook and tell you that you don’t need to use full sentences, eg for the meanings of words. Just be sure to abide by what they say. If you’re told to answer a question ‘in your own words’, that means you can’t use any of the words in the text (except ‘filler’ words such as ‘the’ and ‘of’ or words that don’t have any obvious alternative, eg ‘lightship’ or the names of the characters). You need to show that you understand what’s written in the text, and you’ll actually be marked down for using quotations, even though that’s what’s usually needed. Refer to the text. I know the point of reading the text twice is to try and remember it, but you can’t possibly expect to remember the answers to all the questions and all the quotations to back them up! The answer is always in the text, so don’t be afraid to spend a few seconds going back over it to make sure you get the answer right and are able to support it with the right evidence. Use full sentences. Even if a question is as simple as ‘What is Jack’s dog’s name?’, the answer should be ‘His name is Rover’ rather than just ‘Rover’. The only time you don’t need to use a full sentence is when the question gives you special permission. Make sure any definitions you’re asked for fit exactly in the context. Words have different meanings, so you must check to see whether you have the right meaning and the right part of speech, eg ‘catch’ can be a verb meaning to fall ill or a noun meaning a fish! Nouns also vary in number, and verbs vary in tense and person, so it’s easy to lose marks by putting down ‘destroy’ rather than ‘destroys’, for example. Use PEE (Point, Evidence, Explanation) for longer answers. This is a good way of structuring your answers. The ‘point’ should be a short sentence answering the question as briefly as possible. The ‘evidence’ should be a quotation or another reference to the text. Finally, the ‘explanation’ should make it clear how the evidence backs up your argument. Answer ‘how’ questions be talking about the language. Comprehensions often start with a simple one-mark question such as ‘In what country is this passage set?’ This is a ‘what?’ question, a question about content, about facts. However, there is another kind of question, the ‘how?’ question, which is all about language. Suppose you’re asked, ‘How does the writer explain how Jack feels after losing his dog?’ What do you have to do? What you definitely shouldn’t do is say how Jack feels. The question is not ‘What are Jack’s feelings?’ You’re not being asked for facts but for an analysis of the techniques the author uses. That might include using poetic devices such as metaphor, simile or personification, or it might refer to sentence structure or the use of different parts of speech such as adjectives or verbs. The important thing to remember is that a ‘how?’ question is generally going to be about language, not content. Use the right tense. Most of the time, you should use the ‘eternal present’ to talk about the text, but the most important thing is to use the same tense as the question. Sometimes, passages are about historical events, so the past is more appropriate. For example, if the text comes from The Diary of Anne Frank, it wouldn’t make sense to talk about the Second World War as if it were still going on! Answer all parts of the question. Examiners will sometimes try to catch you out by ‘hiding’ two questions in one. You should pay particular attention to these questions, eg ‘How do you think Jack feels about losing his dog, and how do you think you would feel if you lost your favourite pet?’ It would be easy to answer the first part of the question and then forget about the rest, so be careful! Don’t waste time with words you don’t need. You never have enough time in exams, so it’s pointless trying to pad out your answers by including waffle such as ‘it says in the text that…’ or ‘the author writes that in his opinion…’ Far better to spend the time thinking a bit more about the question and coming up with another quotation or point to make. Use quotations. Whether or not you’re using PEE and whether or not the question asks you to ‘make reference to the text’, you should generally try to back up your arguments with a short quotation or example. Just make sure you use quotation marks or inverted commas, copy the quotation out accurately and drop the key words into a sentence of your own, eg Jack feels ‘devastated’ by the loss of his dog. If the quotation is too long, you can miss words out by replacing them with an ellipsis (…). If it needs a slight change to make sense, you can put the change in square brackets. That’s quite useful if the question is in the present tense and the story is written in the past, eg Jim ‘love[s] strawberries’ rather than Jim ‘loved strawberries’. 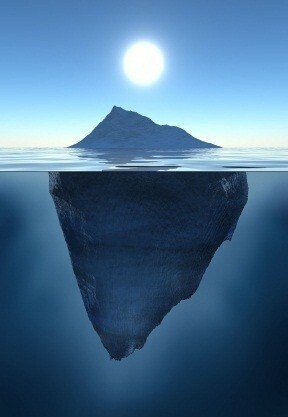 Remember the iceberg! As you can see from the picture, the vast majority of an iceberg remains hidden from view, and it’s the same with the answers to questions in a reading comprehension. Don’t be satisfied by what you can see on the surface. That won’t get you full marks. Like a scuba diver, you have to dive in deeper to find the rest…! Check your work (5 mins). If there’s one tip that beats all the rest, it’s ‘Check your work’. However old you are and whatever the subject, you should never finish a piece of work before checking what you’ve done. However boring or annoying it is, you’ll always find at least one mistake and therefore at least one way in which you can make things better. In the case of 11+ or 13+ comprehensions, the most important thing is to test candidates’ understanding of the passage, but spelling and grammar is still important. Schools have different marking policies. Some don’t explicitly mark you down (although a rash of mistakes won’t leave a very good impression! ), some create a separate pot of 10 marks for spelling and grammar to add to the overall total and some take marks off each answer directly – even if you got the content ‘right’ . Either way, it pays to make sure you’ve done your best to avoid silly mistakes. If you think you won’t have time to check, make sure you manage your time. You’ll almost certainly gain more marks in the last five minutes by correcting your work than trying to answer one more question, so it makes sense to reserve that time for checking. If you do that, there are a few simple things to look out for. You may want to make a quick checklist and tick each item off one by one. Correct and complete answers. This is the most important thing to check, and it takes the longest. Make sure that each answer is correct (by referring back to the text if necessary) and that each part of the question has been covered. Quite a few of my students have needlessly lost marks in practice tests by forgetting to look at all the pages, so you should always check you haven’t missed out any questions. Spelling. This is the main problem that most Common Entrance candidates face, but there are ways in which you can improve your spelling. Firstly, you can look out for any obvious mistakes and correct them. It can help to go through each answer backwards a word at a time so that you don’t just see what you expect to see. Secondly, you can check if a word appears anywhere in the text or in the question. If it does, you can simply copy it down from there. Finally, you can choose another simpler word – if you’re not quite sure how to spell a word, it’s sometimes better not to take the risk. Capital letters. This should be easy, but candidates often forget about checking capitals in the rush to finish. Proper nouns, sentences and abbreviations should all start with capital letters. If you know you often miss out capital letters or put them where they don’t belong, you can at least check the beginning of each answer to make sure it starts with a capital. Punctuation. This simply means any marks on the page other than letters and numbers, eg full-stops, commas, quotation marks, apostrophes and question marks. Commas give almost everybody problems, but you can at least check there is a full-stop at the end of every sentence. Other grammar. It’s always useful to read through your answers to make sure everything makes sense. It’s very easy to get distracted first time round, but it’s usually possible to spot silly mistakes like missing words when you read everything again. This entry was posted in English, Teaching and tagged 11+, 13+, capital letters, capitals, Common Entrance, comprehension, English, punctuation, reading comprehension, spelling, Tutoring on March 24, 2013 by Nick Dale.